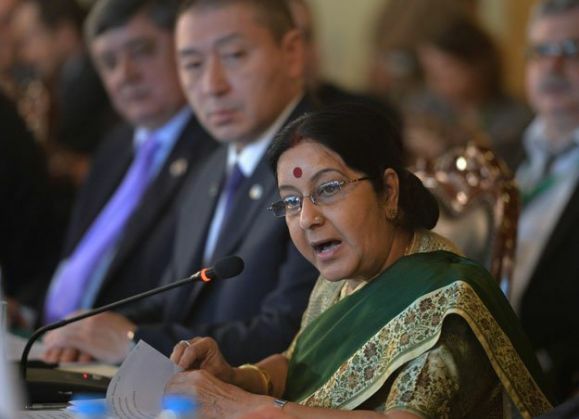 External Affairs Minister Sushma Swaraj, Pakistan Prime Minister Nawaz Sharif and Afghanistan President Ashraf Ghani released a joint statement that focused on improving security and bilateral ties. The statement focused on defence, composite dialogue over the Kashmir issue and is set to pave the path for broader negotiations for when Narendra Modi visits the country for the SAARC summit next year. Dialogue processes, conferences and prime ministerial level meetings between India and Pakistan in the past have been mired in controversy. Some of them have been sabotaged while other attempts have yielded no result in thawing India-Pakistan relations. 1998: A composite dialogue was started between India and Pakistan. For the first time ever, the two countries intended to discuss "all outstanding issues including Jammu and Kashmir". The dialogue had eight subjects: Siachen, Sir Creek, Tulbul navigation project, Terrorism and drug trafficking, Economic and commercial cooperation, Promotion of friendly exchanges, Peace and security - and of course, Jammu and Kashmir. 1999: Then Prime Minister Atal Bihari Vajpayee visited Lahore. Vajpayee and his Pakistan counterpart Nawaz Sharif signed the Lahore treaty - an attempt to ease military tensions between the two neighbouring countries and a commitment towards avoiding the nuclear race. That year, the Kargil war disrupted the talks process. 2001: Pakistan President Pervez Musharraf was invited for a summit in Agra. Sushma Swaraj said the talks failed as he was adamant on discussing the Kashmir issue before all other topics. 2004-2005: Discussions on composite dialogue resume. There was one round of discussions in 2004, and another in 2005. Foreign secretaries held talks which was monitored by foreign ministers of the two countries. 2008: Talks disrupted once again after the 26/11 Mumbai terror attacks, which India blamed on Pakistan. 2010: Talks kickoff again, this time with the label "resumed dialogue". The talks touched upon counter-terrorism - including Mumbai attack trials - and humanitarian issues, which was to be overseen by the home secretary. 2012: Talks halted following firing on the border and the beheading of an Indian soldier. 2015: Indian Prime Minister Narendra Modi met Pakistani counterpart Nawaz Sharif in Ufa. The two sides decided to discuss terror and violence, to delink talks and terror and to create atmosphere for talks. In July, India sent a letter to Pakistan inviting their NSA Sartaj Aziz for talks on August 23. Letters were also sent to Pakistan asking for dates for the meetings of DGMOs, and DG BSF and Pakistan Rangers. In August, Pakistan responded to the letter, and said the agenda for the talks were beyond the scope of Ufa statement. In response, India declared "unilateral imposition of new conditions and distortion of the agreed agenda cannot be the basis for going forward" with the NSA level talks with Pakistan but stopped short of calling off the dialogue. On 22 August, External Affairs Minister clarified there can be no talks involving "third party" Hurriyat, and Kashmir cannot be on agenda as it is against the spirit of Ufa. The minister invited Aziz to talk not involving these issues.